I will not be posting on Sunday. This post will have a religious comment. In the scripture, Luke 15:11-32 tells of the story of the son that took half of his father’s wealth and went into a far country and spent it all in wild living. He hit the bottom and then came to his senses. His father had never given up hope that he would return and saw him a long distance away and ran to meet him. He brought him to the home and ordered a celebration. In verse 22, the father orders the fatted calf killed for the celebratory feast. It was a calf because the pig referred to in the title would have been considered unclean. However, the story came off the page into living reality for me. Inday has a knack for raising animals. People there will give her a pig for raising a few for them. There were three pigs that she was raising for people and the one for her payment. I had made a surprise visit in April of 2015. The volunteers were so happy that I was there that they were discussing among themselves how they could celebrate. Inday offered her payment pig for lechon baboy, which is a whole roasted pig done in a special way that is a traditional celebration meal. 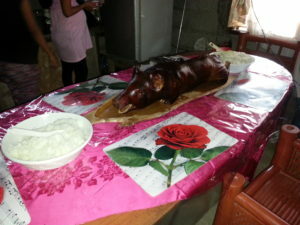 The surprise celebration of Lechon Baboy and rice. She could have finished raising it and sold it for a nice profit. The Philippine people are some of the most sharing and considerate people, giving from their little and not from their excess. Admittedly there are the exceptions to the rule, but they are not the majority. I was taken around the village to see various things and finally noticed that something was going on as there was some whispering and coming and going from the group showing me around. Finally, someone said let’s go to the house. When I got there, I found the lechon on the table with two bowls of rice. They had borrowed a tablecloth to dress up the table. I had taken a small bag of apples for the children so these were cut up and placed into a bowl to add to the meal. While I was not a prodigal returning, I will never hear the story of killing the fatted calf without having a very personal feeling. I am humbled that they felt that way about having me visit.